I can still remember trying to keep track of my three young children in the Walmart aisle. I was reading the back of every lotion, balm and salve on the shelf looking for something that would help my poor husband. He was working overtime in the ICU as an RN. Hand sanitizer had to be applied going in and out of every room, every 15 minutes…12 hours a day…5 days a week. Sandpaper was silkier than his hands. The cracks in them were deep, they hurt, they bled, and nothing I could find helped. I sighed and put one more product back on the shelf. I just needed and answer. My answer came in the form of a suggestion from an older woman just a few days later. One look at my husband’s ghastly looking hands and she turned to me, “You guys raise goats right? You need to make some of that goat milk soap, it will fix those hands.” Yeah right, I thought as I smiled dismissively. We’ve tried everything, nothing works. About 4:00 AM the next morning when my husband left for another shift, I started scrolling through the internet. 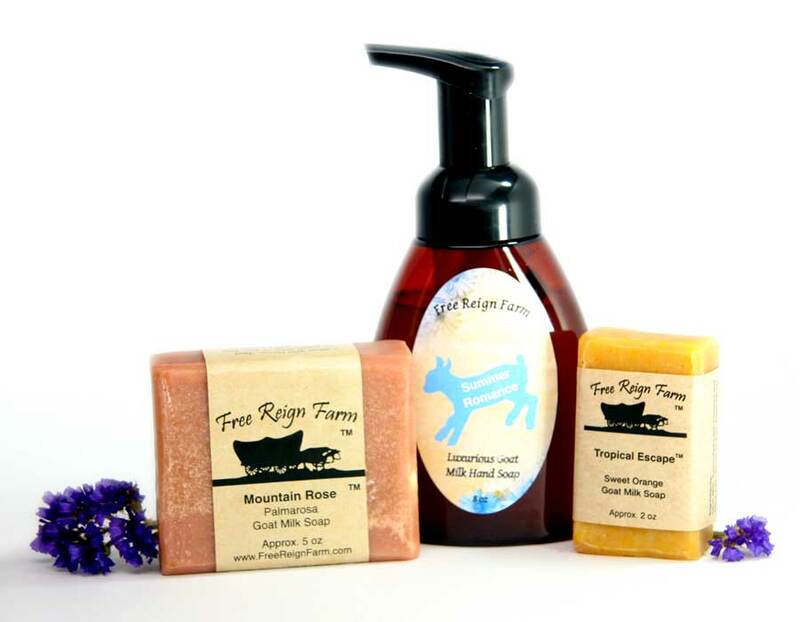 Turns out there are a lot of skin benefits to be had in goat milk soap. More research lead me to a simple DIY recipe for goat milk soap. I ordered the supplies, kicked the kids and husband out of the house (just in case I messed up and blew up the house) and made three tiny bars of soap. They weren’t the prettiest bars of soap, but the house and all living creatures survived my experiment. I set it on the shelf to cure (as the recipe stated) and waited. Just a few short weeks later I handed my “creation” to my husband. He eyed it as if it were a snake that might bite him (yes, it was that ugly) but he agreed to try it. Within two weeks of using his new soap he came to me with hands that were no longer bleeding. Pink skin filled in the deep cracks. After a month, even the white dry flakes were gone. I couldn’t believe it. I made several more batches and the entire family started using it, we were in for an even bigger surprise. Our youngest child had battled eczema, bad enough that at one point her pediatrician put her on steroids. A few weeks after we started using the goat milk soap on the entire family I noticed she wasn’t scratching as much. Wondering if it was a fluke, we started doing some research. What we found indicated that the chemicals not only in soap but shampoo and laundry soaps can cause everything from asthma, to dry skin and make conditions like psoriasis and eczema worse. We ransacked the house tossing out every chemical laden product we could. Which left me charged with the task of creating alternatives for our family. Aluminum-laden deodorants were replaced with natural deodorant, goat milk laundry soap replaced carcinogen laced laundry detergent, fabric softener, and dryer sheets, herbal salve stepped in where petroleum based ointments were, even my favorite candle needed to be replaced with a clean burning phthalate-free alternative. It wasn’t long before realized it wasn’t just us who needed these things. Friends and family started asking us to make some for them. As word spread, so did the product line. The soaps were reformulated to offer the maximum benefits with more goat milk than any other bar. We chose not to use any GMO products or palm oil to eliminate those negative environmental impacts. We also worked to formulate a rich lather and hard, long lasting bar. Above all, it needed to be natural! We chose to use essential oils and herbs in place of any dyes, pigments, or fragrances for our soaps and worked hard to find phthalate-free fragrances for our candles. The adventure is far from over as we continue to look for natural solutions and provide quality products to people who are looking for answers. What started with three goats and three ugly bars of soap has grown into something we never could have imagined when someone suggested we turn a little goat milk into soap. Disclaimer: this article is intended to be informational and biographical in content and is not intended to be used as medical advice. All medical decisions should be made using the advice of your medical professional. The FDA has not reviewed or approved statements regarding the efficacy of any listed products or ingredients to treat or diagnose or cure any disease or medical conditions.